So I understand the reasoning for having two holes on the tallis katan (so that the tzitzis will hang on one side of the corner and won't move around), but why do Chabad tallis katans have the holes at a diagonal? Other Chassidic tallis katans just have two horizontal holes. Photo courtesy of Ben's Tallit Shop. The reason why Chabad follow this practice is because the Rebbe wrote about it specifically in his Igrot Kodesh, Volume 2, pg. 313, letter 342 saying it was the practice of his father-in-law, the previous Rebbe, Rabbi Yosef Yitzchok Schneersohn. Not the answer you're looking for? Browse other questions tagged tzitzis chabad tallit-katan . What is the reason for V-neck Titzis? 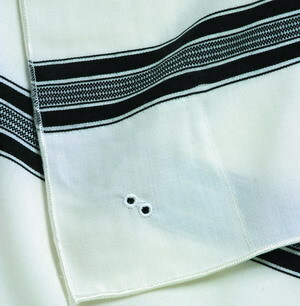 Why do Chabad tallis katans have no fringe along the bottom? Why does a Chabad tallit katan have silk corners?